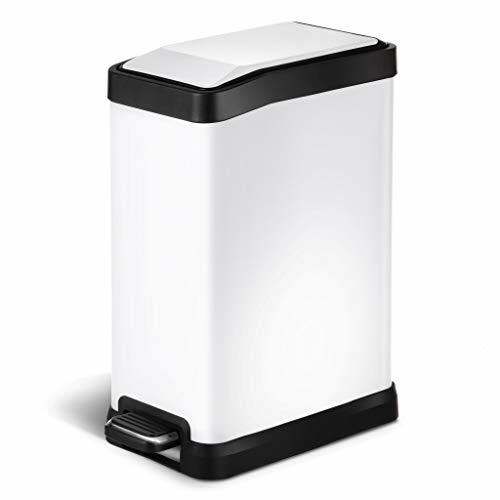 The HomeZone VA41313A 8-Liter Stainless Steel Rectangular Step Trash Can is the perfect way to store trash in your bathroom, office or elsewhere in your home. This trash can holds up to 8-liters, and uses 4-gallon trash bags. The durable pedal design and the stay-open lid makes it easy to lift the lid without using your hands. The stainless steel body of the can has a white finish that resists fingerprints, preserving the clean, stylish look. There is a removable plastic pail to make cleaning and taking out the trash simple, and the rubber band holds the bag in place for a clean look. The HomeZone VA41313A 8-Liter Stainless Steel Rectangular Step Trash Can measures 12.48-inches long, 15.83-inches tall, and 6.65-inches wide. HomeZone products are both stylish and functional, allowing you to make the most out of every space in your home.